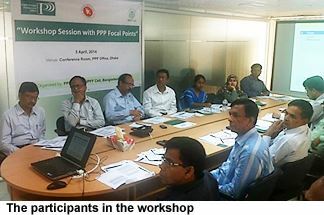 As part of its plan to conduct a series of stakeholder's workshop, the PPP Office organized a workshop session with PPP focal points at PPP Office Conference room on 3 April 2014. The workshop formed part of PPP Office program activities for wide dissemination of PPP information to public sector officials. The objective of the workshop was sensitizing and developing capacity on PPP issues among the PPP focal points from various GoB line ministries and implementing agencies. The workshop also aimed to develop capacity to the participants on advanced PPP project development and transaction issues and create awareness on latest PPP progress and achievement in the country. Md. Abul Bashar, Deputy Manager of PPP Office welcomed the participants at the inaugural session. He highlighted that the event formed part of PPP Office’s continuous initiative to develop capacity among the focal points. Three different sessions were conducted from different speakers from the PPP Office. Dr. Humayun Kabir, Deputy Manager presented the overview of PPP activities in Bangladesh. He described the various phases and activities that led to the recent PPP momentum in the country. Mr. Sukesh Kumar Sarker, Deputy Manager described the process and procedure for project development and transaction stages that a PPP project undergoes. The final session was led by Mr. Syed A. Uddin, CEO who provided an overview of the PPP achievements being made in the country. He also described some new proposed projects from various agencies and suggested the way forward to deal with them. A question and answer session was conducted after the presentation sessions and the presenters responded to issues and queries raised by the participants with various examples and case studies.